One of the oldest Catholic cemeteries in Albany was that of St. John’s, situated on Delaware Avenue, formerly Delaware Turnpike, a short distance south of Morton Street. It was purchased by the congregation of St. John’s Church, in Albany, from Henry and Mary Ann Newman, August 28, 1841, for $1,500. This was long before there was a Bishop, and even before the diocese of Albany was formed. 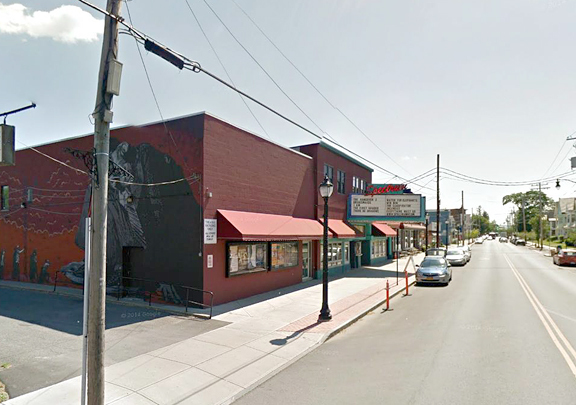 It comprised seven and fifteen-one- hundredth acres which was only about three city blocks long and one city block deep. When the cemetery was created in 1841, the property had been part of Groesbeckville, a hamlet in the Town of Bethlehem, Albany County. It was considered in those days to be far in the country. Groesbeckville was annexed by the City of Albany in 1870. 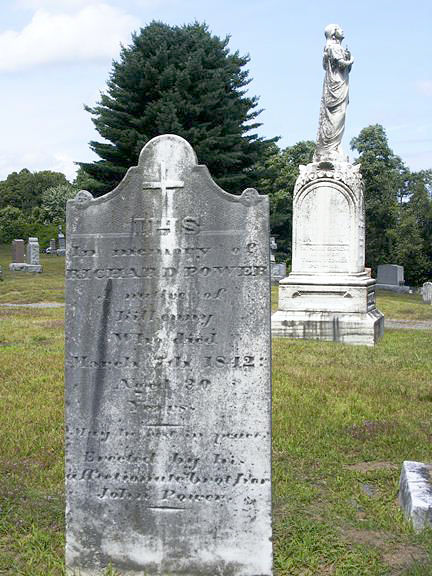 As the city of Albany was rapidly expanding, there was some political pressure to force the cemetery to close. As this condition fermented for years, St. John’s Church in 1875 established the present Calvary Cemetery in Glenmont, a hamlet in the Town of Bethlehem. The original St. John’s Church in Albany was located at South Ferry Street and Dongan Avenue. That church building was no longer adequate as the congregation had outgrown the building due to the number of Irish famine immigrants that began pouring into Albany during the 1820’s and 1830’s. As will be evident in the summary of details from the interment records of St. John’s Cemetery, the parish of St. John’s was overwhelmingly Irish. To accommodate the influx of these Catholic immigrants, a much larger church building was required. 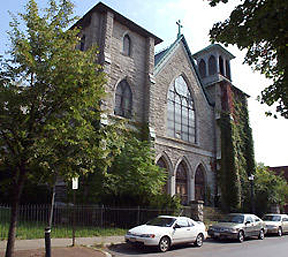 The new and larger St. John’s Church was constructed in Albany’s South End, on Green Street. It was designed by the important Albany architect Charles Ogden, the son of William Ogden, architect of some of Albany’s most important buildings, including the Kenmore Hotel and the Old Federal Building. Charles Ogden began work on the new church in 1903 and it was completed in 1908. St. John’s Church closed in the 1970’s when it merged with St. Ann’s Church to form St. John’s/St. Ann’s Catholic Church The abandoned St. John’s church building, while still standing, has now fallen into serious disrepair as shown by the photo below. In 1878 and 1879, the Albany City Council ordered that no further burials were to be made in St. John’s Cemetery. Burials, however, continued as late as 1888-1890. Reinterments from St. John’s started in the early 1900’s. Many of the people interred there were reinterred to the new Calvary Cemetery, while others were reinterred to St. Agnes Cemetery in Menands, St. John’s Cemetery in Rensselaer or to other area Catholic cemeteries. April 24, 1842. Stone and remains now at Calvary Cemetery. According to an 1880 newspaper article, upwards of 21,000 people had been interred in St. John’s Cemetery. It is interesting to note that as late as September 2009 a number of skeletons and coffins were uncovered at the former cemetery site during work on Delaware Avenue. It has been widely reported that the interment records for St. John’s Cemetery were lost or destroyed. However, the historian of St. Agnes Cemetery in Menands, in a chance conversation, found that a retired Calvary Cemetery employee was in possession of the St. John’s interment book which she promptly recovered. The binding of the book is rotted and the loose leaf pages were in disarray and some pages were missing. A number of pages also were quite stained and a few had crumbled edges where some information was lost. However, scanning of the pages did provide a good enough image to allow the transcribing of this extremely important historical data. The book is now with a preservation company which will stabilize the fragile pages. The 12,731 entries in the recovered book start with interments in August 1841 and go through September of 1887. During the 46 years of record keeping for this interment book, there have been several recorders employed by the cemetery, each of which filled out the entries in a different manner. One of the recorders named M. Murray made a beautiful ink and colored drawing shown below on one of the pages in March, 1854. 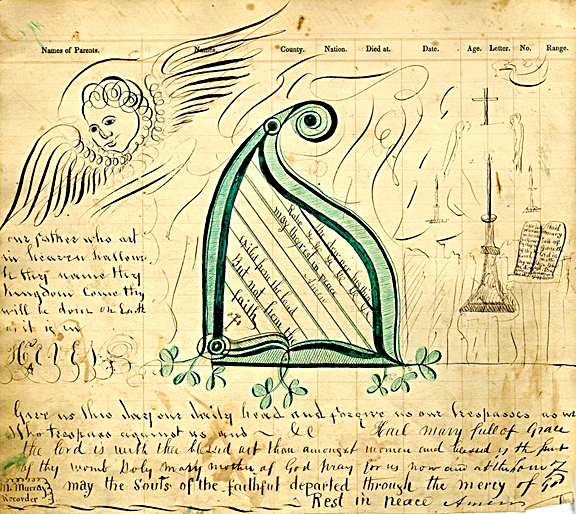 The drawing shows an angel head with wings (Soul Effigy), an Irish harp and green shamrocks, a candle holder and cross along with prayers including the Hail Mary and the Our Father. The preprinted column headings on the interment book were for parent's names, name of deceased, date of interment, county of residence, country of residence, place of death and grave location. In the beginning years all the pages were filled out correctly and the entries in each column reflected the pre-printed heading. Then in later years the recorders ignored the pre-printed column headings. Entries on some pages had the cause of death or the address of the deceased written across all columns on the page. Quite a few pages had no entries at all in many of the pre-printed columns. The one item in this interment book that will delight genealogy researchers is the identification of the County in Ireland where many of the individuals came from. Generally in researching old records for Irish immigrants you only see the words Ireland and nothing further. Also identified are individuals from the following states; California, Colorado, Connecticut, Georgia, Illinois, Iowa, Louisiana, Maryland, Massachusetts, Michigan, New Hampshire, New Jersey, Ohio, Pennsylvania, Vermont and Virginia. As would be expected, Albany with a total of 5,815 records was shown as the county of origin for the largest number of individuals. Of course this figure includes the second and third generations of those early Irish immigrants. As you look at the alphabetical listings of the surnames you would think you were looking at a current Irish telephone directory. A smaller number of records shows one or two individuals from all over New York State cities, towns and counties while three locations show a heavier concentration; Rensselaer with 106, Greenbush with 77, and New York City with 63. The place of death information was only reported for 9,447 entries with Albany being the predominant death location reported. It is more than likely that Albany was also the place of death for the majority of the 3,284 entries where no place of death was indicated. A Remarks column has been added to the transcribed records to show the extraneous entries that were made on the pages which did not follow the pre-printed column heading. These entries cover items such as address of deceased, cause of death, free grave, died in the poor house, private or no baptism, reinterment from another cemetery, interment in lot owned by other individuals or in Potters Field, etc. Of particular interest is that 189 individuals are identified as cholera victims during two outbreaks in Albany in 1849 and 1854. Then there are the over 46 young children that Died of Teeth. A few reinterments from St. Mary’s Cemetery in Albany are recorded. 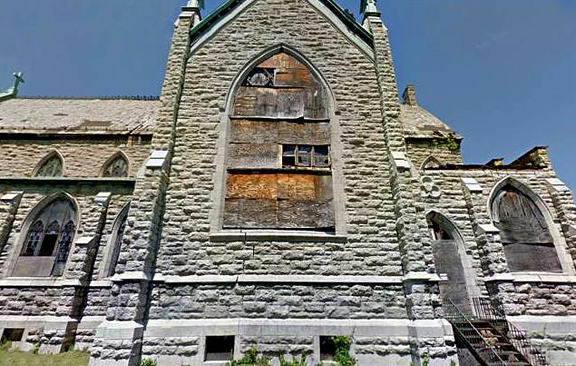 Under PROJECTS on the TIGS website you can read more about the closing of St. Mary’s Cemetery, currently the site of Albany High School on Washington Avenue as well as the closing of the State Street Burial Grounds, currently the site of Washington Park. There were 190 records, mostly of still born children, identified as Unknown. On forty-six of these records, the given names of the parents was reported but the recorder did not enter the family surname in the interment book. In reviewing the individual pages of the St. John’s Interment Book, it was quite apparent that several family members were interred on the same date or within days of each other. As this obvious relationship would not be so apparent when all 12,731 records were merged together, a notation about this was made in the Remarks column. The data base created from this amazing long lost historical document, from a cemetery that had interments over 173 years ago and that has been closed and has not existed for over 100 years, is a genealogists dream come true.